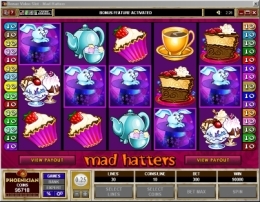 Mad Hatters is a Microgaming Slot Game Release. Play Mad Hatters at any of our Recommended Microgaming Casinos. 50 free spins! Ouch! That is just what you could win in the Mad Hatters bonus round. This fun, 5 reel, video bonus slot has 30 pay-lines, a coin range from 1¢ to 25¢ and let's you wager 1 to 10 coins per pay-line. The most frequent hits occur with just 2 strawberry topped chocolate cup cakes or gold tea cups stop on a covered pay-line. The next paying hit comes when 3 ice cream treats, ice cream cakes or tea pots stop on a covered pay-line. 3 colorful Mad Hatter characters round out the pays and a match of 3 on a covered pay-line can net a win of 20, 30 or 50 coins for a single coin wager. Substitute the Big Red Top Hat Wild symbol to complete or supplement a winning combination. Get the Big Red Top Hat Wild symbol on reel 3 and it literally expands to cover additional pay-lines. This can really increase your win total. Get all 5 and you could win the top prize of 20,000 to 200,000 coins! Any 3 Cuckoo Clocks stopping on adjacent reels trigggers the Cuckoo bonus round. With 3 you get to pick 1 Cuckoo Clock to reveal your coin win. 4 Cuckoo Clocks gets you 2 picks and 5 Cuckoo Clocks award 3 picks. The top prize in the Cuckoo bonus round is a whopping 11,100 coins and the Cuckoo bonus rounds come up often! Trigger a 10 free spin bonus round when 3 Rabbit Magician scatter symbols stop on any reels, get 4 and you win 25 free spins, get 5 and you're awarded with a massive 50 free spins! All hits in the free spin bonus round are multiplied by 2 except for the Cuckoo bonus round and a Mad Hatter doubles as an extra wild symbol. Covering all 30 pay-lines results in a hit on almost every spin and increases your take when the Big Red Top Hat Wild symbol stops on reel 3 as well as in the free spin bonus rounds. Phoenician Casino offers over 400 different video bonus slots, including 21 progressive jackpots and table games.